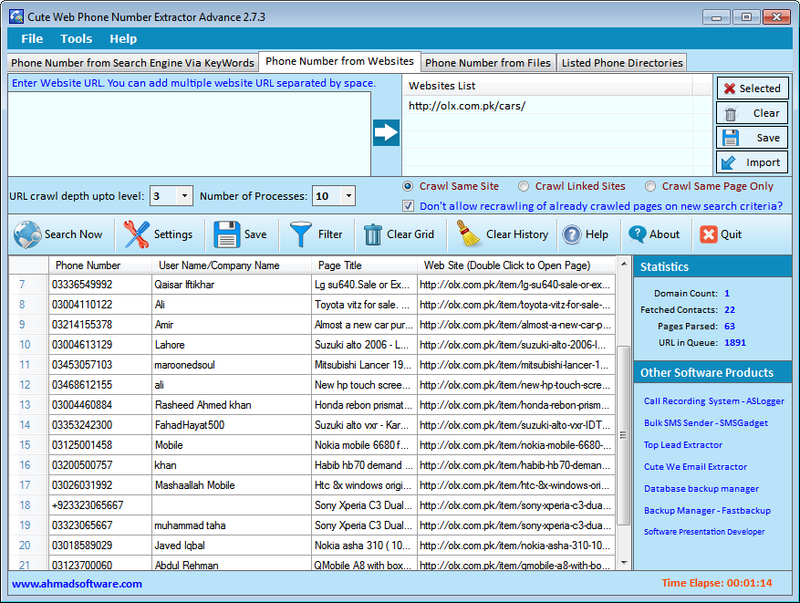 Extract Phone Numbers along with user/company name from specified list of web sites. 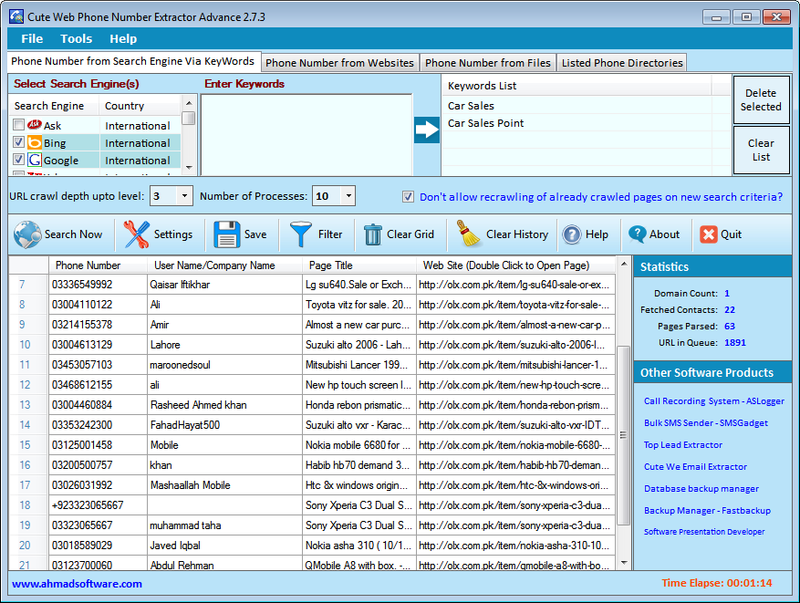 Extracts Phone Numbers from INTERNET through keyword on diffenent search engines. Extract Phone Numbers from specified list of web sites. You can also search phone numbers from non-encrypted files on your computer. We have added most well-known phone directoy and business directory sites. To save bandwidth and your precious time "Cute Web Phone Number Extractor" has an option "Don't allow recrawling of already crawled pages in new searches". "Cute Web Phone Number Extractor" automatically pauses/resumes on internet failure during processing. Cute Web Phone Number Extractor support more than 66 search engines. You can search according to your country. How Telemarketing boost up Your Business? Telemarketing is a quick and affordable means to contact prospective customers directly over the phone and subsequently even face-to-face to convince them to buy a product. The age of smart phones, apps and mobile internet access has made marketing more convenient and steady. Many businesses communicate with their customers, handle enquiries; give quotes and takes orders over the phone. Small firms that target business customers can use the telephone to call sales leads, give quotes and arrange appointments. Besides talking directly, recorded sales talk can be played over the phone through automated dialling. Why need Phone number Extractor? Approaching the real person in an industry you intent to market your product or getting information of their product is a worthwhile effort and impossible to collect million of numbers from the people of different professions. 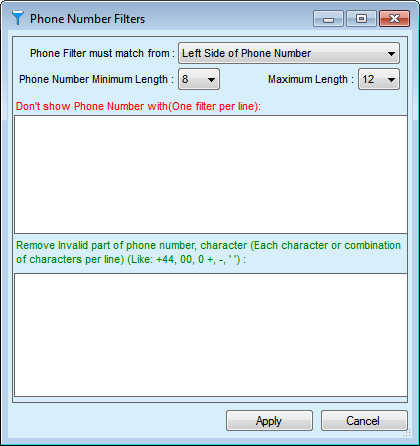 A Phone number Extractor software can do this within minutes. An extractor extracts your desired numbers from search engines, or from files on computer. Why Cute Web Phone number Extractor? Cute Web Phone number Extractor is a very powerful and reliable tool that can automatically search all of the phone numbers from web pages and retrieves absolutely all valid numbers without duplicates. It do not affects the server during crawling. Program can extract can your targeted customers phone/mobile numbers from internet/websites or files on computer. You can extract phone/mobile numbers by the entered keyword related to your niche. The program will use the search engine(s) specified. Then it will scan all of the websites and look for information. We have listed well-known phone directory sites and we have also created custom tags to pick username alongwith phone number. Phone dirctory listing supports users to find their targeted customer quickly insead of searching on internet. If you know a website where your potential clients communicate, click on "Extract phone numbers From Websites" and enter the URL in the "Websites List". Our program will collect the phone/mobile numbers for your targeted clients. This is one of the best ways to create a targeted contact list. Software provides a facility to filter your search results based on the page level contents. If page will have your defined page level filters(cosmatic, sales agent, software company, UK Bank) then page will be parsed to get phone numbers/username otherwise page will be skipped. 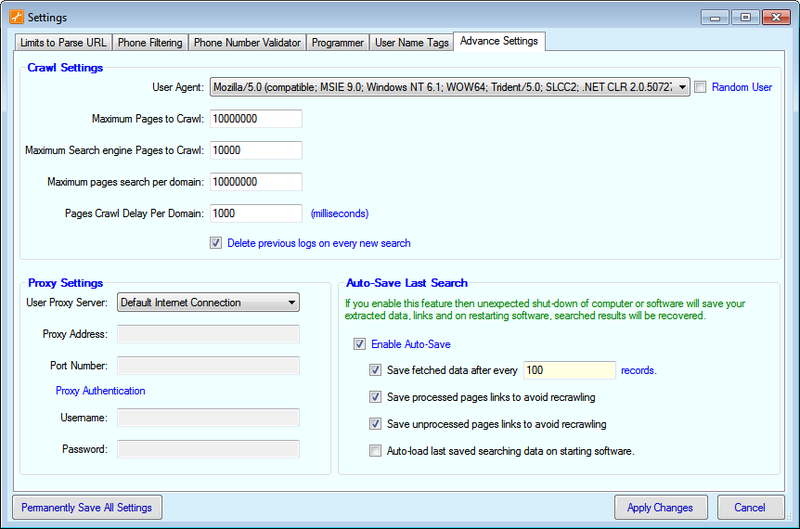 You can control the Software searching and crawling behaviour by providing URL based filters. If URL will have your defined URL-level filters(e.g. sales-agent in http://www.xyz.com/sales-agents/descr.html) then page will be fetched otherwise page will be skipped. You can filter phone numbers based on country codes. 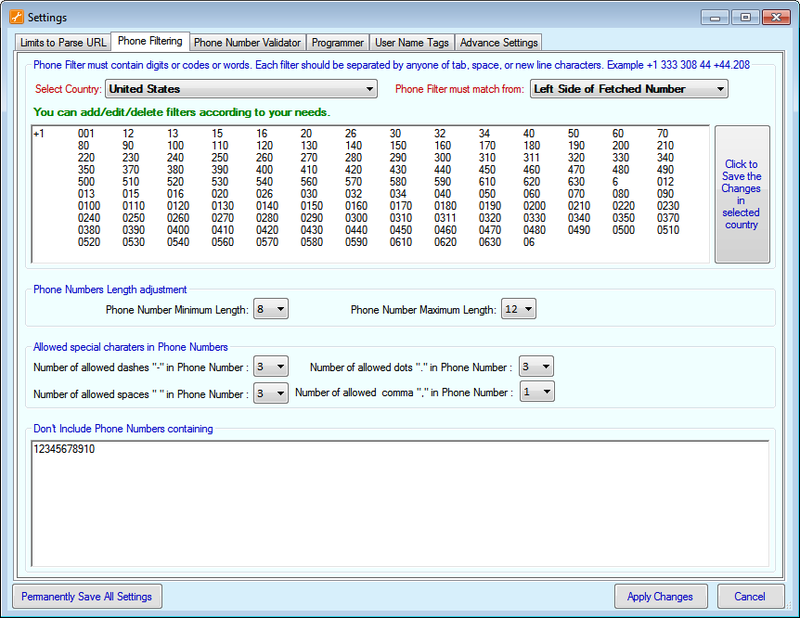 Our software can extracts any country phone numbers in the world. In the settings, you can tell the "Phone Extractor" which types of URL should not be crawled. You can also apply phone filters to get your targeted phone/mobile numbers. Phone Extractor does not require a proxy to connect to the Internet. Some of the websites and search engines limit the number of simultaneous queries from one PC. To circumvent this limitation, you can use a proxy server. 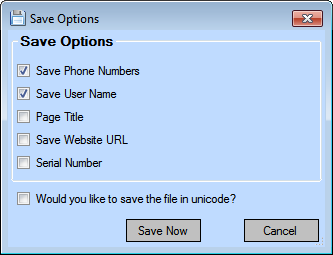 Phone Extractor support unicode charaterset. You can save fetched search results in unicode format. Software automatically pauses/resumes on internet failure during processing. Software provides options to save phone numbers in EXCEL format, .CSV files (Opens in EXCEL), TAB delimited (.txt files) format. There is only one difference between simple version and advance version. Advance version can pick username along with phone/mobile number with custom tags but simple version can only extract phone/mobile number. Don't parse and crawl URL having: "Cute Web Phone Number Extractor" will not crawl URL if URL contains keywords listed in list. You can remove any keyword from default list. To filter and remove bad Phone Numbers (if any) click on Filter button on toolbar and a popup will open like this screenshot. All in one "Top Lead Extractor"
Comments: Wonderful software, a part from the number I can get the person’ name and address in seconds. Highly recommended for marketing. Comments: excellent phone extractor to pick any country phone numbers. Comments: The software is doing a great job and works as advertised. I am using it to scrape phone numbers for my sales calls. Comments: Thank you for making such a great software. Comments: I found this software from Google Search result. At first, I tried to get similar function freeware but unable to get one. Then I search for paid version and compare and I found this software. The price is still acceptable compared others similar software. After used, I found it meets my expectation and serve the purpose i buy the software. I am happy with the customer service which reply my e-mail promptly. It allows me to shift using the software from old laptop to new laptop.